Thorneycroft Solicitors are experts in helping people who have suffered pain or injury following lack of clinical care and medical negligence. Our experienced team of medical negligence solicitors cover a wide range of medical negligence claims for those who have received inadequate care from healthcare providers including NHS hospitals, GPs and dentists. 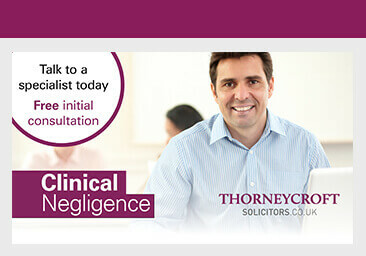 Thorneycroft Solicitors are one of the UK’s leading medical negligence law firms. Our team of specialist medical negligence solicitors have an excellent reputation for successful medical negligence cases, hospital claims and medical negligence compensation payouts. Our specialist medical negligence solicitors have successfully represented clients who have sustained injury as a result of sub-standard medical and clinical treatment across a variety of cases including birth injury, general surgery, brain damage, spinal injury, infection, misdiagnosis and late diagnosis of illness. If you, or a member of your family have suffered a medical injury as a result of substandard medical treatment you have received, our specialist team can assist you in bringing a medical injury claim against those responsible. We have won many medical negligence cases against a wide variety of medical professionals and organisations, including GPs, NHS hospital trusts, midwives and pharmacists in and around Macclesfield, Manchester and Cheshire. Clinical and medical negligence claims can be extremely complex. It is therefore vital that you utilise the services of a specialist medical negligence solicitor, who understands the medical and legal issues involved in such cases. Thorneycroft Solicitors not only have the right expertise and knowledge but we also offer a caring and sensitive service which recognises the individual needs of each medical negligence claim. Our specialist medical negligence solicitors will proactively progress your compensation claim and will help you with any concerns you may have. Wherever possible there is an emphasis on reaching an early compensation agreement or interim payment to help with any expenses resulting from the injury that has been suffered. Our medical negligence claim solicitors have consistently achieved excellent results for our clients in Macclesfield, Manchester, Cheshire and surrounding areas and remain dedicated to maximising the compensation for medical negligence available on a no win – no fee basis.